2017 was one of the hottest years ever. New temperature records in Toronto. President signs bill increasing research. Sea levels rising; cities under water. Climate change beliefs as function of age. How global warming is affecting California. Animal, Insect, & Bird Ranges Shrink. 2018-JAN-18: 2017 was one of the hottest years on record. NASA released a report, concluding that 2017 was the second warmest year on record. They found that global average temperatures were, on average, 1.62°F (0.90°C) above average temperatures from 1951 to 1980. NOAA released an independent report indicating that 2017 was the third warmest year on record. 1.51°F (0.84°C) above average temperatures from 1951 to 1980. The two agencies used slightly different averaging techniques, and so came up with slightly different values. But their calculations agreed that the five hottest years have occurred since 2010. There have been many statements in the media that are similar to following type. However, this one caught our attention because Toronto is just upwind from our location on the Northern shore of Lake Ontario. The Office of Energy Efficiency and Renewable Energy received a 14 percent bump. The Advanced Research Projects Agency-Energy got a 16 percent increase. It is a priceless satire, uncomfortably close to reality, that is not to be missed. Jakarta is the largest city in Southeast Asia. It is also the fastest sinking city in the world, sinking almost ten inches a year. About 40% of the city is now below sea level. The main cause is the existence of private wells for drinking water. Only about one-third of the population is served with piped water, so some residents are digging wells deeper in the ground to access ground water. The land then sinks because of the weight of the city's concrete and buildings. The partial melting of the Earth's existing glaciers. 70% of young adults from age 18 to 34 worry a great deal about global warming. This variability is to be expected because the effects of climate change will proceed slowly in the future, and persons aged 55+ years only have about 25 years additional life expectancy or less. Concern about climate change also differs by political party: 18% of Republicans and 66% of Democrats "worry a great deal." 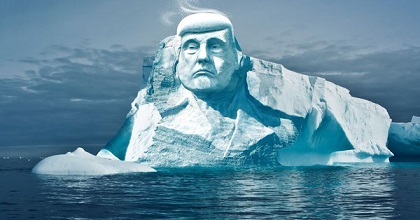 2018-MAY-11: Activists in Finland are raising money to carve "Mount Trumpmore:"
A group called Melting Ice is fundraising 400,000 Euros (U.S. $473,000) to carve a 115 foot (35 meter) image of President Trump in a melting glacier somewhere in the Arctic. Over time, the image is expected to melt, providing a convincing indication of global warming -- which Trump still denies. Artist's simulation of what Mount Trumpmore would look like. Burning natural gas to generate electricity is much less polluting than burning coal. An article by the Associated Press appeared to link the eruption of the Hawaii volcano with the "Ring of Fire." The latter refers to the hundreds of volcanoes that surround the edge of the Pacific Ocean where underground tectonic plates are converging. 16 The original version of the article suggested that the Hawaii volcano could trigger other volcanoes on the "Ring" to erupt. In reality, Kilauea -- and all the other volcanoes that formed the Hawaiian Island chain, are located in the center of the Pacific plate, not at its edge. So Kilauea cannot trigger eruptions elsewhere. 17 The article has been corrected. A second piece of misinformation was posted on Twitter and has since been deleted. It had suggested that Kilauea might be about to blow with a force as devastating as the Krakatoa volcano did during 1883 CE in Indonesia. That killed more than 36,000 people. 17 In reality, the U.S. Geological Survey said that there is an increasing chance that a local steam explosion(s) could happen in the future at Kilauea like they did in 1924. However, the danger to local communities from steam explosions is limited. "18 percent of insect species, 16 percent of plant species, and 8 percent of vertebrate species saw their geographic ranges shrink by more than half. Under 1.5 degrees C of warming, those numbers fell to 6 percent of insects, 8 percent of plants and 4 percent of vertebrates." "Losing half the range is a pretty big impact, because that means [the organisms] stop contributing as much to the ecosystem." 2018-MAY-31: Gov. Gerry Brown (D-CA) commented on the U.S. exiting the Paris Accord being: "... far more serious than anyone is saying:"
He addressed the Carbon and Climate Neutrality Summit at the University of California. "... promised coal renaissance sputtered. Rollbacks of environmental protections are tangled in court. Even automakers aren’t on board for his push toward heavier-polluting cars. But even so, a year after President Trump pulled out of the landmark Paris Accord on climate change, the struggle to contain global warming has grown considerably more complicated without the prodding and encouragement once provided by the U.S. government. And though many in the climate movement hope progress toward cutting emissions can continue despite Trump’s retreat, there are growing doubts about reaching the Paris agreement’s goal of limiting global warming to 2 degrees Celsius, if Washington does not re-engage soon. "He has set in motion initiatives that will cause damage. You are falling down four stories, but have 80 [sic] to go. Maybe you are not damaged yet, but it is certain you will die." Not that it matters much, but the Empire State Building actually has 102 stories. “This is real. It is far more serious than anybody is saying." "Teddy Roosevelt talked about speaking softly and carrying a big stick. Donald Trump is tweeting loudly and carrying fiddlesticks. The level of damage is not as much as one might have thought, given all the tweeting and speeches." "If we are going to take this [Paris Accord] target seriously, we need federal action. ... There is still time. We can still do something in 2020 or 2021 or after."